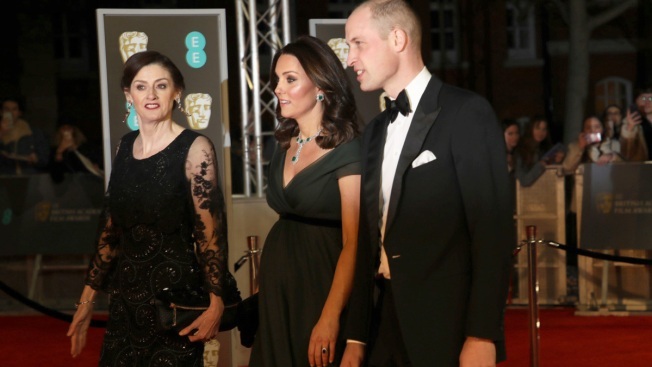 Britain's Kate, the Duchess of Cambridge, centre, and William, Duke of Cambridge, right, arrive with Chief Executive of BAFTA Amanda Berry at the BAFTA Awards 2018 in London, Sunday, Feb. 18, 2018. The 2018 BAFTA Film Awards, or BAFTAs, once again became a royal affair with the presence of special guests Duchess of Cambridge Kate Middleton and Prince William. The Duchess of Cambridge, who is expecting their third child and is in the third trimester of her pregnancy, and the Duke of Cambridge joined scores of celebrities at the annual event, which took place at the Royal Albert Hall in London on Sunday. The two have also attended the BAFTA film awards last year. Middleton walked the red carpet in a flowing forest green empire waist gown with a long train and black sash, paired with diamond and emerald earrings and a matching necklace and a black clutch. Prince William wore a black tux. Celebrity attendees included Angelina Jolie, Jennifer Lawrence, Game of Thrones alum Natalie Dormer, Chiwetel Ejiofor, Naomie Harris, Salma Hayek and Sir Patrick Stewart. Nominated stars for the 2018 BAFTAs include Three Billboards Outside Ebbing, Missouri's Frances McDormand, I, Tonya's Margot Robbie, Lady Bird's Saoirse Ronan, Get Out's Daniel Kaluuya, Phantom Thread's Daniel Day-Lewis and Call Me by Your Name's Timothe Chalamet. Most of the nominees are also nominated for Oscars. The 2018 Oscars will take place on March 4.